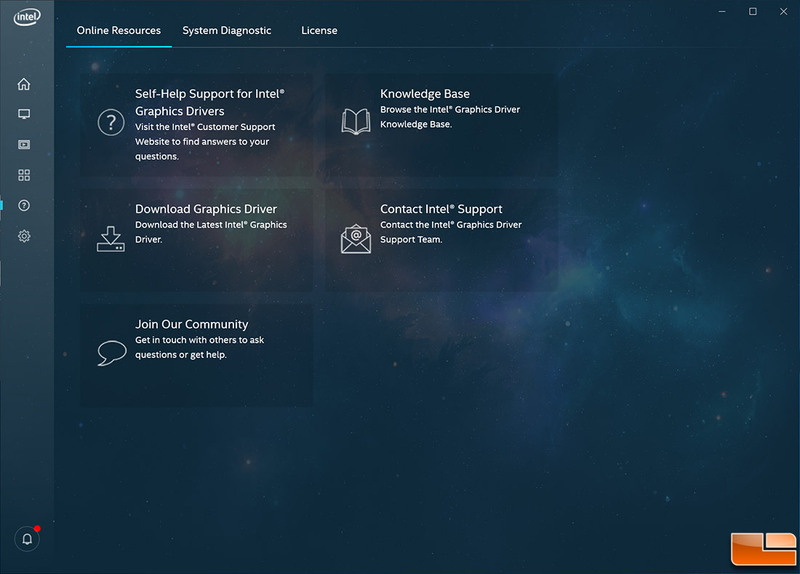 The Intel Graphics Control Panel has been updated over the years, but it was due for a major update ahead of Intel entering the discrete GPU market. Intel went back to the drawing board and developed a new one from the ground up. Not a bad idea as the control panel hasn’t had a major update since 2014. 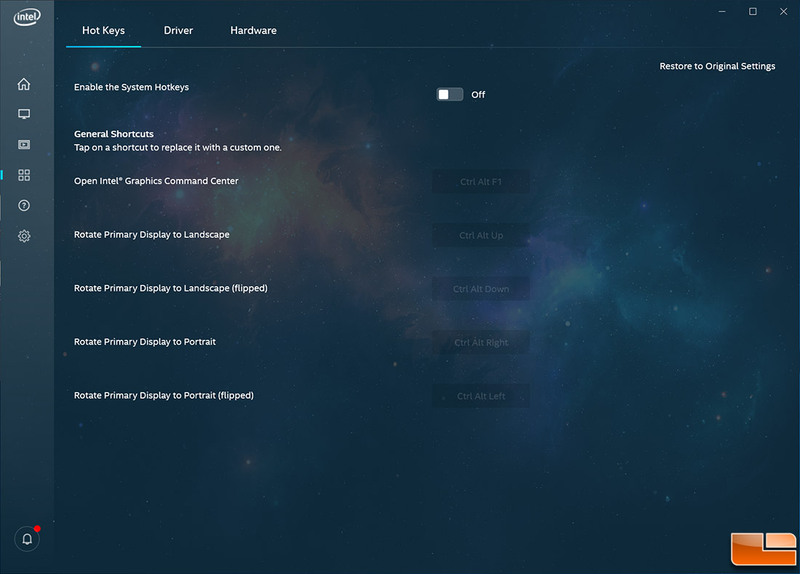 Intel is calling the new control panel, the Intel Graphics Command Center and it is a stand alone application that will allow you to control your Intel graphics solution. Intel says that hundreds of hours of discussions with gamers and content developers was done at various community events to help them create a modern app with all the needed features. 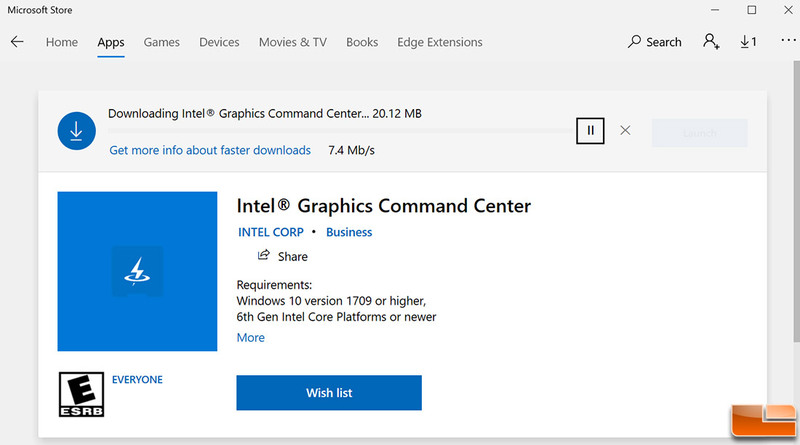 The Intel Graphics Command Center is a lightweight app that is just 93 MB in size and will work on 6th Gen Intel Core platforms (circa 2015) or newer that are running Windows 10 v1709 (RS4) or newer. Windows 7 and Linux are not supported at this time and no timeline was provided if any such support would be included. The IGCC download will be available on the Microsoft Store tonight and will be shipping with Intel Ice Lake processors later this year. This will be the foundation for Intel to release their top to bottom graphics solutions. Legit Reviews got early access to the application and gave it a quick try on one of our Intel Core i7-8086K platforms that we had setup in our office. 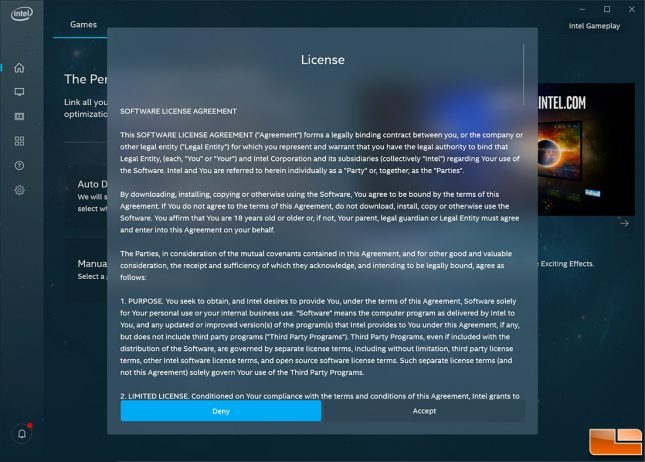 Once the application is installed you’ll see a software license agreement that you’ll need to accept to use the Intel Graphics Command Center (IGCC). The consent clause in these agreements is important to read, so lets take a closer look at that. It basically said that Intel, its subsidiaries or suppliers may collect and technical and related information including but not limited to the Software serial number, technical information about your computer, system and application software, and peripherals. There doesn’t seem to be a way to opt out of any of this for the time being. It also says that any feedback given to Intel can be used by them royalty-free. From there you’ll be taken to the home screen, which is shown above. 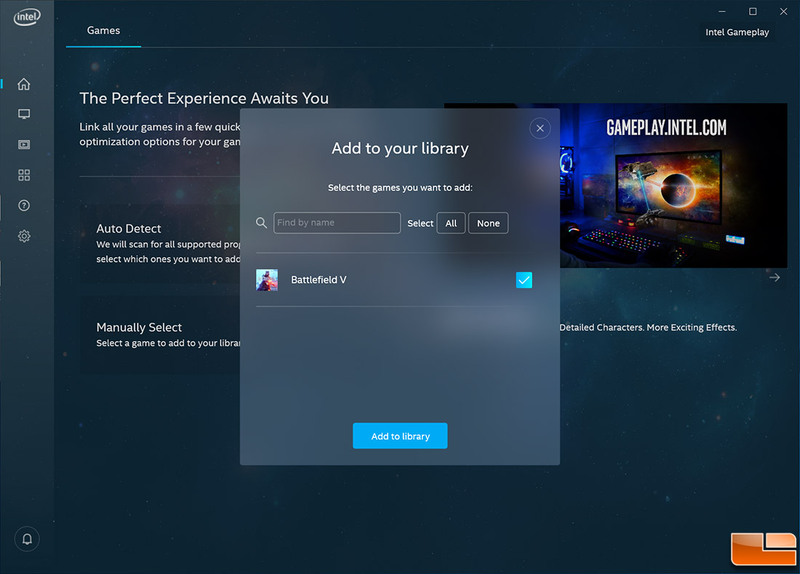 The main purpose of this home screen will allow you to link all your games to IGCC either through an auto-detect system or by manual selection. 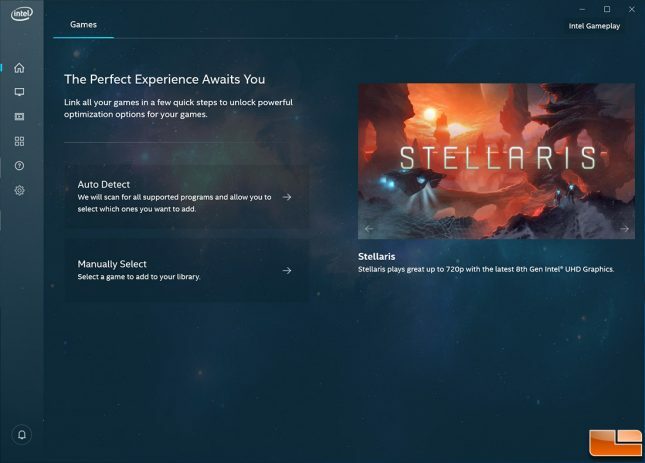 On the right hand side of the screen were promotions for Fornite and Stellaris. IGCC showed that Stellaris plays great at up to 720p display resolutions with the latest Intel 8th Gen Intel UHD Graphics. Right now Intel only has integrated graphics solutions, so this is the starting point for game optimizations. 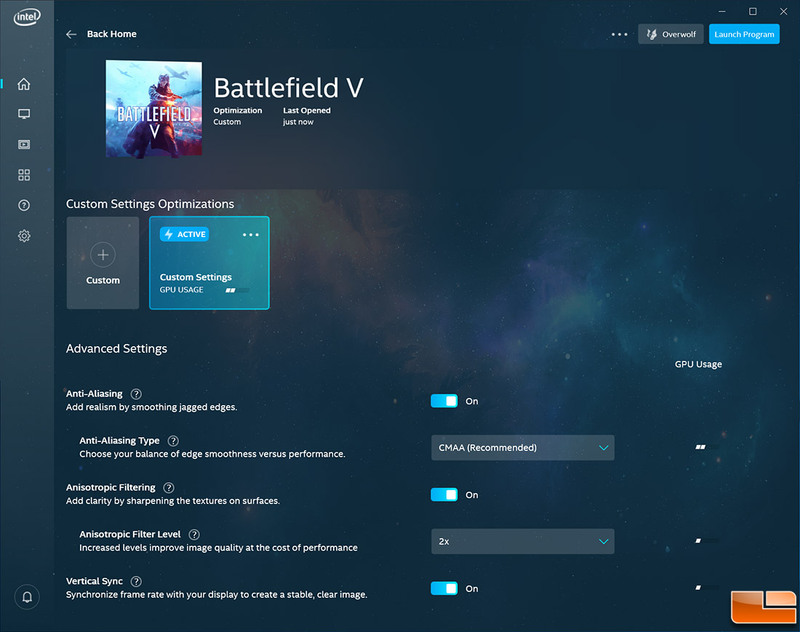 We only had Battlefield V on this particular drive and it was picked up by auto detect and able to be added to the game library. Right now over 30 game tiles feature 1-click game optimizations. Below is the list of the 30 supported game titles for the early access launch. One-Click optimization was not available on IGCC for our platform and we couldn’t figure out why not. It turns out that the Intel Core i7-8086K processor with Intel UHD Graphics 630 does not meet the minimum requirements to be playable. It does not tell you this information in IGCC, so we were confused at first as this was a supported game title. The advanced settings (Anti-Aliasing, Anisotropic Filtering and Vertical Sync) were still shown since those are specific in-game settings. Intel has room for improvement here as they could have informed the user that the game didn’t meet the minimum requirements. We then installed Overwatch on our system an Intel Optimization radio switch appeared along with a button that allows you to view settings on Intel Gameplay. This is what you will see when you have one of the supported games and your GPU meets the minimum game requirements. The connected display tab in IGCC is where you change the resolution, refresh rate, scale and rotation of the display. 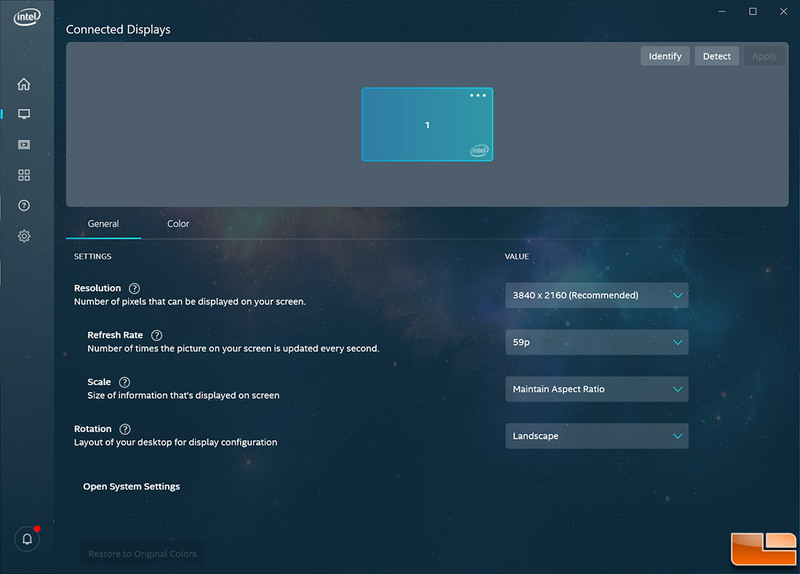 Our Acer Predator X27 4K HDR 144 Hz gaming display was detected by the app without issue. 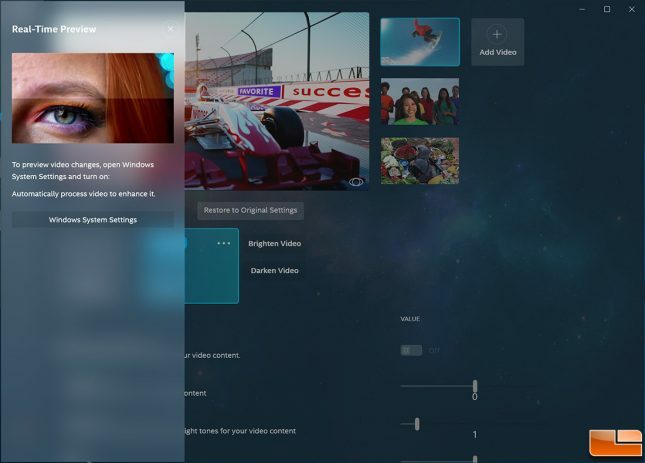 Next would be the video menu that allows you to adjust video settings and see the changes in a real-time preview. The system menu allows you to adjust hot keys and shows driver as well as hardware information. Next you have the support menu that directs you to online resources, allows you to see system diagnostics and the app license. The system diagnostic menu shows if you are using the latest driver or not. If you are behind on drivers it will also be shown on the alert icon. If you are not using the latest driver you’ll need to install the Intel Driver Support Assistance (IDSA) Tool. 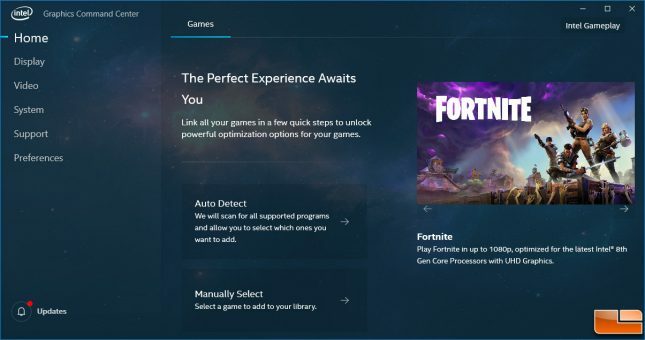 It would be nice if you didn’t have to install another application and this is an area that Intel could still improve upon. 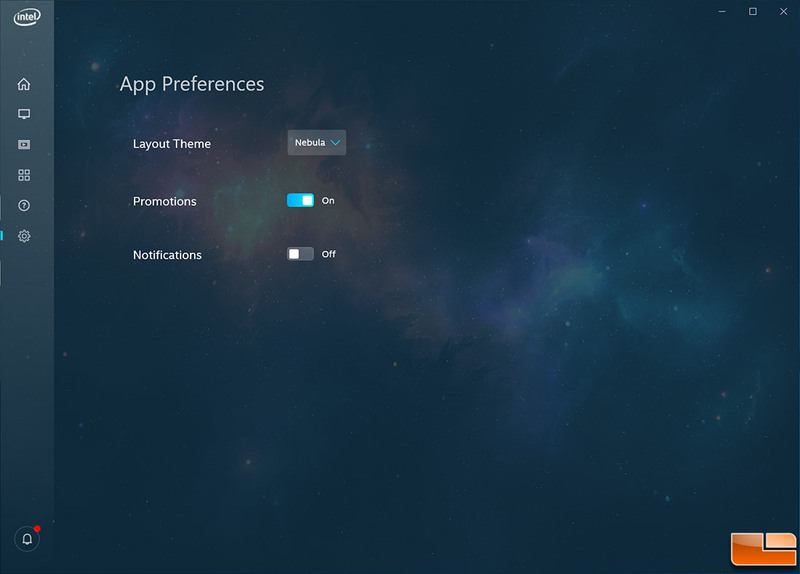 The final menu is App Preferences and here you can change the app theme and enable or disable promotions and notifications. 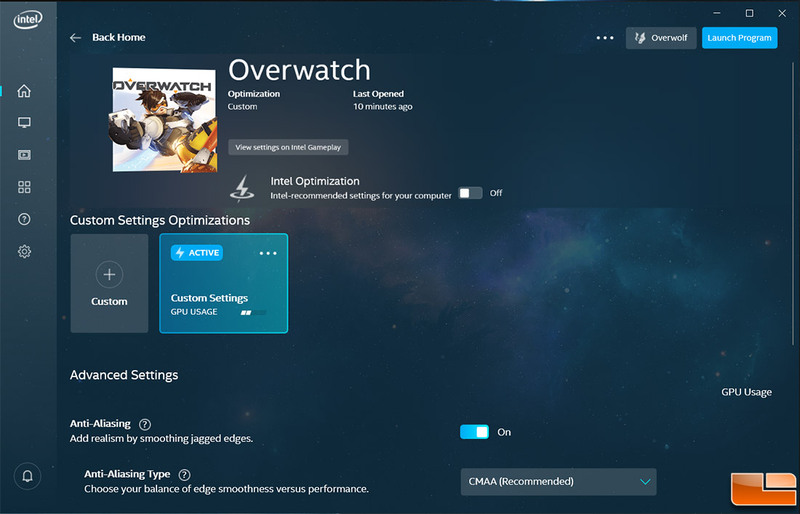 Right now only two themes are available, but that number is expected to blow up by the time this early access (pre-beta) software is ready for its official debut. Right when we got done trying out IGCC for the very first time we noticed that if you expand IGCC changes the menu branding. When expanded the navigation icons go away and you get the actual names of each menu. What are your thoughts about the new Intel Graphics Command Center? Do you want your feedback to be heard? Intel recently launched a new community program that is known as ‘The Odyssey,” that allows people to discuss and share ideas for its upcoming graphics cards and software solutions. By signing up to the e-mail list you’ll also be informed of the latest developments and get invites to online and offline events that you could possibly attend. 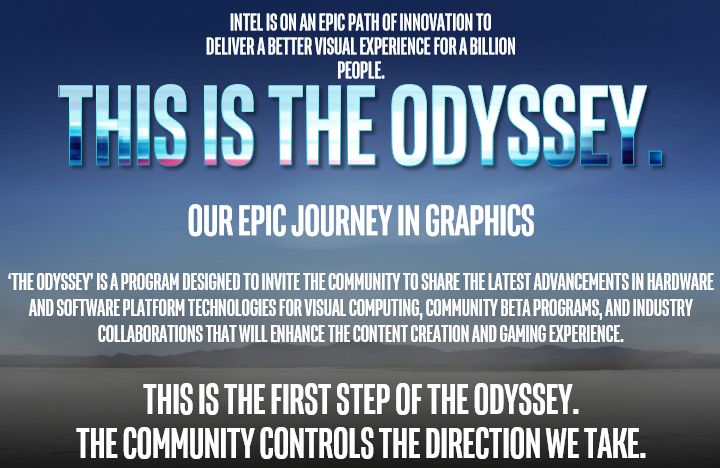 You can register for ‘The Odyssey’ for free on this page.